USA’s Jason Brown performs a split jump during his long program at 2014 Skate America. USA’s Jason Brown captured silver in his first Grand Prix of the season at 2014 Skate America in Chicago, Ill., last night. The 19-year-old is on his second Grand Prix season as a senior, finished fifth at this event last year. The 2014 U.S. national silver medalist had to overcome a rough start in his short program when he fell on his opening triple Axel, but rallied back to land a triple flip-triple toe, triple Lutz and three level-four spins, earning 79.75 points. In the long, Brown landed a triple Axel, a triple Lutz-single loop-triple Salchow sequence and level-four spins and footwork, but he missed the second triple Axel. He finished third in the free skate with 154.42 points, and with an overall score of 234.17 points, maintained second place to win the silver. It hasn’t escaped Brown, whose hometown of Highland Park, Ill., is just north of Chicago, that there has never been a senior level competition in the “Windy City” in the past. He really never sought an answer and just accepted it. Coming off the Olympic season, training has been going well for the skater, who made the move in May 2013 (along with coach, Kori Ade) to train in Monument, Colo. The two-time World Junior medalist credits “pacing” as being one of the major keys to his success last season. The 2011 Junior Grand Prix Final champion had just experienced his first Grand Prix season last year where he competed at Skate America and Trophée Éric Bompard. Brown had a good start to the season after he won gold at 2014 Nebelhorn Trophy in Oberstdorf, Germany, earlier last month. The 2013 Trophée Éric Bompard bronze medalist earned excellent program components scores (PCS) at Nebelhorn, particularly in the short program. The jubilant skater found it rewarding as he feels he has so much more left to give in the program. Although he won both the short and long program in Nebelhorn, Brown got called on several underrotated jumps from the panel in the long program, including his opening triple Axel. Brown did not take any time off after the Olympics, and dove right back into training in preparation for this season. 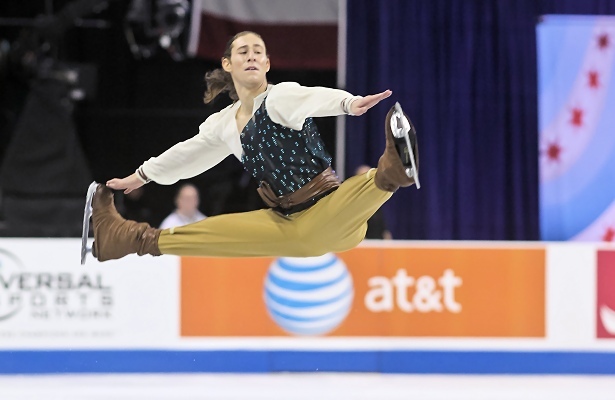 This season, Brown is skating to “Juke” by Little Walters for the short program, and “Tristan and Iseult” by Maxime Rodriguez for the long. Both routines, which are a contrast from last season, were choreographed by Rohene Ward. Brown admits that it took a bit of time to get accustomed to the new themes, but that having the music three weeks after the Olympics was helpful. The 2010 U.S. national junior champion is also working hard on the quad. Brown generally tends to be straight-forward when stating his goals, for example, making the World team. For Brown, this season will be about peaking at Worlds. Brown is currently scheduled to compete next in three weeks at the 2014 Rostelecom Cup in Moscow, Russia. Javier Fernández is the first figure skater from Spain to medal at the World Championships, European Championships, or a Grand Prix event. More on Javier Fernández on Golden Skate.